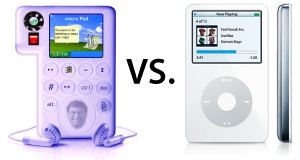 The rumor mill keeps spinning as analysts and several reliable sources report that Microsoft is preparing an iPod and in iTunes rival, with the same pricing and selling structure as Apple’s iPod+iTunes. Microsoft tis also seeking another additional feature that could give the new Microsoft MP3 player an edge over the iPod – wireless capabilities. Capabilities to download music and movies over the air without the need of a computer could be the future of the music download industry. Microsoft is supposedly pouring money into this project for it to be released before the holiday season with a big marketing impact. A new rumor is stating that Microsoft will scan the iTunes library for every song bought on iTunes and will grant the user one free song for every song bought on iTunes when he/she switches to the Microsoft software. Microsoft is also heard to be discussing with may record companies with a model that could benefit the record companies more than Steve Job’s $.99 pricing structure. Apple is also suspected to release a wireless-integrated iPod with a larger screen in time for the holiday season to ensure the iPod’s future and boost sales for the holiday season. The iTunes Music Store is also expected to start a new service for selling full-length movies, with a possible name change to the generic name “iTunes Store”. An iTunes Store with music, videos, and movies could really foil Microsoft’s plans for an iPod killer. Microsoft has the resources to develop a great iPod+iTunes competitor, but it is likely to never reach the success the iPod has received. Microsoft is too late to beat out the iPod’s progressing sales, and not even its plan to redeem all music bought on iTunes for a free WMA song will change that. Consumers are now comfortable with Apple because they are secure and cutting edge, and Microsoft’s approval has really taken a hit as many consumers are sick of being plagued with an insecure, unstable, ugly PCs. Thanks for the comment over at Textonic. I agree that Microsoft has the resources to compete, but as we all know they’ve never really succeded in the hardware market. This could be a success though. And who did that mockup, it’s hilarious! umm, yes they have; here’s some of their products which are [or were] very popular, mice/keyboards, joysticks (now discontinued), software for mobile devices (pdas and so on), xbox, xbo360 and so on. 1. Mice, keyboards, and joysticks are peripherals, not hardware. 3. There is no “so on”.